Latest First Aid Instructor Projects. Some of our latest projects are listed below. You can click on any of the pictures to be taken to the website for a more detailed description of the website and the layout that the instructor wanted through their design brief. 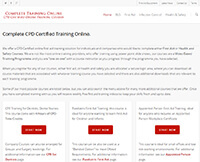 Complete training online offer CPD certified online training courses. They wanted a website that was fully responsive and would work on mobile devices, so customers can see the courses they offer and complete training, even if they only have a mobile phone. To visit their website, either click the picture above, or you can follow this link: Complete Training Online. 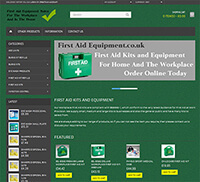 First Aid Equipment is an online retail shop selling first aid kits and equipment for the workplace and the home. Their website is also fully responsive and all payments for their products can be taken online through a card payment facility, or by bank transfer. Either click the image on the left, or follow this First Aid Equipment link to be taken to their website. We developed this website for SKSProtraining, they offer first aid training in Bedfordshire and surrounding areas. They also offer onsite training for companies and group bookings. Page’s were developed for their onsite training and also the online programmes that they offer. We also added a Facebook feed, so that the company can keep people up to date with their latest news. See their website by clicking the picture or follow this link: First Aid Bedfordshire. 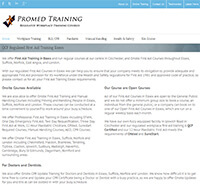 Promed Training Limited offer workplace regulated first aid training in Essex and have a large website that incorporates all of the courses that they offer, which includes onsite and also online training. Facebook, Google+ links have been added and also their is a testimonial page, with comments from past students. To visit their website, either click the image on the left, or follow this link: First Aid Training in Essex.